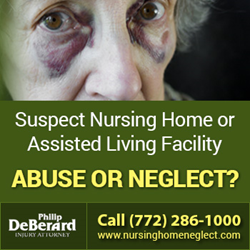 Philip DeBerard, III of the Port St. Lucie Florida based law firm The Law Offices of Philip DeBerard recently launched a new billboard ad campaign in order to raise awareness on the grave issue of nursing home neglect and abuse. Florida has a high population of people aged 65 and over, many of which live in nursing homes, assisted living facilities, adult family-care homes, and continuing-care retirement communities. The 2011 Annual Report of Florida’s Long-Term Care Ombudsman Program disclosed that more than 7,500 complaints were made concerning residents of nursing homes and assisted living facilities. These complaints ranged from cases of abuse that were physical, emotional, and sexual in nature to caregiver neglect, abandonment and financial exploitation. The legal team at The Law Offices of Philip DeBerard is passionate about seeking justice on behalf of nursing home abuse victims. DeBerard’s new billboard ad campaign calls attention to the fact that these problems are real. The attorney vehemently believes that victims of nursing home neglect and their loved ones deserve justice, and must be properly compensated for their physical, emotional, and financial damages. Philip DeBerard, III is a reputable attorney who has practiced law for over three decades, representing numerous injury and accident victims since 1975. He is among the first attorneys in Florida to become board-certified as a civil trial lawyer, he is also recognized by the American Trial Lawyers Association to be one of the top 100 trial lawyers in the state and recently got the "10 Best" of 2014 Client Satisfaction Award from the American Institute of Personal Injury Attorneys. The Law Offices of Philip DeBerard Injury Attorney, have offices in Stuart, FL and West Palm Beach, FL and also serve clients in Fort Pierce (http://www.ftpiercelawyer.com), up and down the entire Treasure Coast and all throughout South Florida.